Secluded crofter’s cottage with a Finnish Grillikota (BBQ hut) for a unique cooking experience - Dunvegan and Armadale Castle easily reached.. Enjoying a secluded, yet easily accessible location, this cosy former crofter’s cottage has been sympathetically renovated to provide stylish accommodation. In the garden is a fabulous Finnish Grillikota (BBQ hut) where barbecue cooking can be enjoyed all year round - just the place for that special meal. 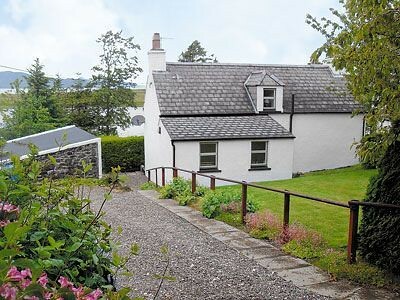 Only 2 miles from Broadford and 4 miles from the Skye bridge, this detached holiday cottage is ideally placed for touring the mystical Isle of Skye and the west coast. 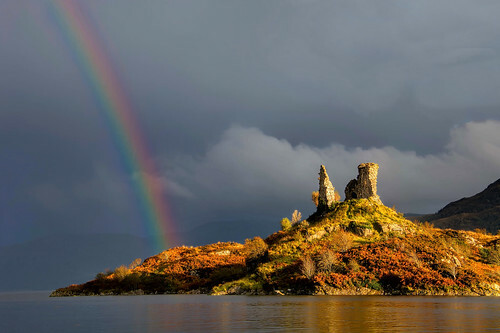 Armadale Castle and the towns of Portree and Dunvegan are recommended. Superb area for kayaking and many other water sports, mountain biking, climbing and relaxing. Shops and pubs 2 miles. Living room with gas ‘coal-effect’ fire and French doors to patio. Cosy dining room. Well-equipped compact kitchen. Sitting room with wood-burning stove and TV. Bathroom with shower cubicle and toilet. First floor: Double bedroom. Twin bedroom. Single bedroom. 1st comment: Cottage is lovely and was clean and tidy and more spacious than we had expected. The outdoor BBQ hut was great and enabled us to do something different with the kids even when the weather was not so good (it is Scotland after all). Gardens were also tidy and pleasant. Recommend. March 2011. 2nd comment: Very comfortable, peaceful, well kitted out. Feb 2011. 3rd comment: Well appointed character property. Modernised to a high standard offering every mod con but with the added bonus of the Finish BBQ hut so whatever the weather outdoor life can be enjoyed. Sept 2010. 4th comment: A very well-appointed cottage in an excellent location. Lounge was particularly good, and Sky TV in two rooms much appreciated. The barbecue hut is a nice touch - pity I couldn’t catch a fish to make use of it! June 2010. 5th comment: The property was in a excellent location, close to all amenities and was extensively equipped to cater for all our needs, The owner went the extra mile with the welcome pack and wine. already considering our next break there. Feb 2010. 6th comment: An absolutely stunning property, set in even better countryside. Oct 2009. 7th comment: The Skye scenery is wild and spectacular and well worth visiting. Visited Armadale castle and gardens and found this value for money, and would recommend a visit. Visited Plockton and took a boat trip there, which was also good value for money, would also recommend the chip shop there! Claymore Restaurant - lovely food, good service and reasonably priced. 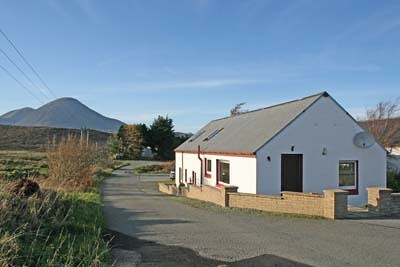 Rowan Cottage was comfortable, clean and well equipped with nice extras such as lots of books, games, dvds etc. Although watch out for the access road - can scrape the bottom of your car if you are not careful. ~The towels which were provided were new, was a nice touch. Generally we felt the cottage was comfortable and well-equipped. The property has obviously been extended several times, making it large and spacious. Particularly liked the fact that there were two sitting rooms. The large sitting room is especially light and bright and is a pleasant room. Liked the kitchen. Aug 2009. 8th comment: Wonderful spacious lounge with great views. The landing had great views of the hills. 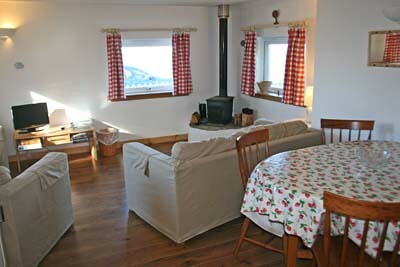 The cottage was sympathetically decorated and well equipped. July 2009. 9th comment: Nice clean warm and comfortable. Not well worn like some accommodation. Sept 2009. 10th comment: This is an excellent property with a great location just off the main road from Lochalsh to Broadford on the Isle of Skye. Internally the standard is five gold stars and I shall certainly try to book this cottage for my next visit to Skye. Two lounges with two TVs - great for mixed company. And the mini lounge upstairs for the sunset - WOW. June 2009.